NEWS 2018: The Union Kitchen Annex is closed down. 'Annex' is located at Grønnegade 37 in a small petroleum blue basement. Annex offers a range of different open-faced avocado toasts, seriously good coffee and handsome guys behind the desk. Go get some! The atmosphere is calm and warm and Annex could easily be appointed to be the perfect intimate coffee cave that has been missing in inner CPH. Wondered what this is all about? For me its exiting news! Kenneth and I decided to join creative forces by creating this concept of stories of the best places or experiences we meet on our way. Wether it's at home in CPH or out in the big world. For us it's about sharing gems and spreading the word to all of you. We combine art direction, photography and writing and all content of 'his & her TASTE' is created in collaboration between the two of us unless something else is stated. Dinner. Thursday 28th of April I had the opportunity to join a dinner held by B&O Play and Kinfolk in the new Kinfolk Gallery. The occasion was a joined event; the celebration of the launch of the long awaited A1 speaker from iconic B&O Play designed by talented danish Cecilie Manz Studio, as well as the celebration of the first event and dinner ever held in this new Kinfolk space in Copenhagen. Fall 2015 Kinfolk relocated its HQ from Portland to the heart of Copenhagen. Personally I have kept an excited eye on the process of this HQ coming together in my city. So it was quite honestly a great honor and experience to be seated together with Kinfolk and such an iconic danish company as Bang & Olufsen, for a joined event. Not to forget to have been given the possibility to talk with people that pose such an influential and defining inspiration for so many people working in the creative field of design, visual identity, sound, aesthetics and lifestyle. After everyone greeted each other by the hand, which sadly happens quite rarely in the field of design, fashion and media, the mood for the night was set. I would describe it as, personal. The dinner was cooked by Mikkel Karstad, and served all family-style. 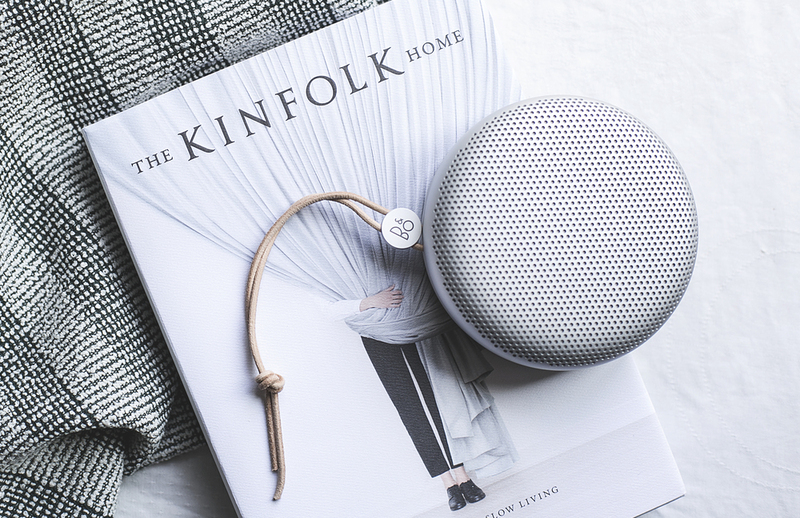 In perfect alignment with the conceptual and ideational DNA of Kinfolk. But somehow I was still surprised that the table was set by the Kinfolk team itself - even founder and editor in chief Nathan Williams was involved by carrying the dishes out as they were ready to be served. No one too fancy to bring a plate. It encouraged us all to get involved around the table and it felt warm and family-like. I tell this to picture how down to earth, delicate and sincere these guys are working - even after 5 years since the company's foundation and a whole lot of success later. It gave me a whole other level of inspiration and respect for this business. This made me reflect upon how I have been feeling about marketing in generel on social media. Let me elaborate. It's important for me to state that this post is no way near sponsored and by that also totally impartial (not that B&O or Kinfolk would need my promo anyway, but). So these are my personal views and phrases. Give and take. Watching this journal post from a rather analytical perspective: Yes. I took pictures and I wrote about this evening for 'free'. I did so because I was not asked to. I was happily seduced by intelligent elements, such as no encouragement posting pictures or using a specific hashtag in return for the experience - and its interesting that this, atm is what motivates me. I have used a couple of years in the media field already, turning down an endless amount of offers of products in exchange of photos on my Instagram account and a caption telling how much this product changed my life. So why did I turn each one down? This 'classic' approach to SoMe brand marketing seems unimaginative and straight provocative to me (let me just clear out that doing commissioned work is another thing than doing these promo posts). Because.... It take form as the exact opposite of a sincere recommendations or guidance, when telling to use a specific product only because you were paid to have this opinion. It is permeated by interests and screams 'I love it because I was paid to do so'. Who do we want to be. I'm quite determined about that the person and the values I pose on social media, should by all means reflect the same ones as I practise in real life. I would never give my mom or a friend or even a stranger on the street asking for help, an answer I was paid to give. Most people wouldn't. And I think we need to incorporate this mindset in the digital-life with its current massive presence in our life. In all levels and forms. Anyway, luckily what I sense is that more and more developed a well-trained eye for this kind of marketing and we are more rejective towards it. I don't want to feel pushed to promote, neither 'used' as a consumer. I want my mind to be seduced by stories, feelings, experiences, quality, but most importantly, get inspired and activated to create and add value to the collective myself. An approach. And this is exactly the feeling I got from the gathering held by B&O and Kinfolk. They straight-up upgraded people to sensuous human beings from being just consumers. They give and they make you want to invest yourself in return, without loosing anything. To give a tangible example it was liberating to experience a dinner place card with my simple name handwritten on it, not followed by a hashtag and a line of instructions of how I should spread out content on social media. To you guys. My recommendation. So my point is that I wrote all of this simply motivated by a very rich personal experience. Consisting of different elements such as the the unconditionally approach, the conversations I shared with people twice my age and also these elaborating thoughts I have had in the realms of the evening. Finally I do so because I actually want to give my recommendation of these two companies and the people behind as I appreciate what they create and how they do it. What makes the bigger difference is how a vision is carried out and how it makes us all feel. Last thursday left me feeling humble. Thank you.